I’ve been playing with headers this morning. (That picture at the top.) Playing is the operative word here. Mostly I stumble and fumble until I get something that isn’t too awful. LOL. I’ve had several up there today. A pair of toy flamingos, a herd of cattle, an old house. Right now these yellow buildings are winning. They’re all pictures I took while in Kansas last week. The header was just the buildings. Categories: Small World | Tags: Kansas, Oklahoma | Permalink. When you woke up this morning, did you look out and see a perfect blanket of white covering the world? If you live in north-east Oklahoma or southern Kansas, you could have. What’s everyone’s first thought when they see that kind of weather? Kids usually think: Yaaay! Snow day!!! Mamas: Oh, no. A snow day. As a kid, I was lucky enough to have a mother who enjoyed snow as much as I did. We’d play out in it until we were wet all over from throwing it or rolling in it, then we’d run into the house with our teeth chattering and our lips blue. Mom would put dry clothes on us, dry our hair and give us hot chocolate to drink. About the time we drained the last drop, we’d be warm and raring to go out again. And Mama always put dry clothes on us and let us go back out. She never complained or wished we’d stay inside. And more often than not, she’d find time to go out and play with us sometime during the day. When I was growing up, we lived in C-Town where Kaw meets D Street. For two or three blocks, our neighborhood teamed with kids. We lived across the street from two boys named Mackey, who could throw really hard snowballs. Next door was the Lunsford Family, whose daughter, Susie, taught us to play Fox and Geese in the snow. She also showed us how to make snow angels. Mom voted down the angels because we got too wet, lying in the now. On snow days, all the kids flocked outdoors to play together. We’d divide up and have snowball wars (not a lot of fun if you didn’t get one of the big guys on your team) or we’d build snowmen or go sledding. After the grown ups wore our runners to nubbins and the highway patrol wouldn’t let us hook our sled behind cars anymore, our parents bought us a “real” sled, which really wasn’t as much fun. But if you want, you can read about that first sled in sleddy memories here. As I got older, I didn’t play outside in the snow as much. And the school didn’t give us a snow day if the roads were just a little slick. One of those days, Dad volunteered to drive me to school so he could teach me how to drive in the snow. We drove around the corner on Kaw and along the curve of C Street, then turned up Cemetery Hill. He stopped in the middle of what he was saying because just about that time, a car coming down the hill toward us turned sideways and starting sliding, taking up both lanes. Dad pulled to the edge of our lane. And then, because the out-of-control car was heading right for us, he got over more. And then we went in the ditch. A few years later when I was in college in Joplin, I got to try out my excellent snowy road driving lessons. The road in front of my dorm had a stop sign, then turned either up or down hill. Trying to use those excellent lessons, I turned up hill and slowly pushed the gas. I got started, then the car (a ten-year-old 98 Oldsmobile) stopped going altogether. Next thing I knew, I was sliding backward. I thought I was going down that long hill, so I jammed on the brakes. That did no good, so I yanked on the emergency brake. Absolutely nothing. I kept sliding, just like a rock. “Want me to move it for you?” one of the guys who lived in the dorm asked. He got inside, started it, put it in gear and without a single slip or slide, calmly drove it to the men’s dorm, where he parked it. And that’s where it stayed until the spring thaw. A couple of years after I left Ozark, I married G-Man. When we’d been married a few years, we decided to start our family. The due date for our first son was January 24th. That year we had nearly weekly snow storms. We even stayed with Mom and Dad and my sibs who were still at home because the roads to the house where we lived were awful. For some reason, when it snowed during my pregnancy, I craved popcorn, popped in oil, with butter. That wouldn’t be so bad if I’d given it up after #1 was born, but to this day, for me the perfect snow day includes yummy, salty, buttery popcorn. And if possible a Diet Dr. Pepper. 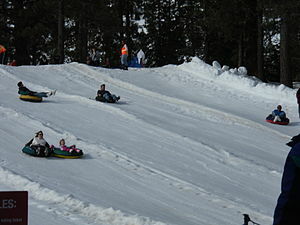 Categories: Small World | Tags: Cemetery Hill, Family, Kansas, Oklahoma, Oldsmobile, Sledding, Snow, Snow Day | Permalink.